There is nothing better than taking a hot shower after a long day in nature. This rejuvenating experience cleans your body while also giving you a clear state of mind. Thanks to modern technology there are now solar showers that you can use while on the go. They are perfect for camping or any other outdoor situation. For your convenience we have gathered the best solar showers on the market and reviewed each one. We recommend looking at each device and deciphering which one is best suited for your particular needs. So enjoy the article and contact us if you have any questions. First on the review is the Advanced Elements solar shower. This is by far one of the best showers on the market due to its large capacity and durable design. It’s truly made for the outdoors and will last years without having any issues. This particular shower bag has a large capacity of 5 gallons. While this isn’t the largest capacity on the list, its more than enough to get the job done. In fact, it can successfully clean 2-3 people if used correctly. To heat the water the Advanced Elements shower bag uses the power of the sun. For this to occur all you need to do is fill the bag up and put it on the ground with the black side facing up. Set it in the sun for 1-3 hours and the water will be ready to use. One great thing about the Advanced Elements is that heating time is quick and efficient. The bag uses a 4-ply construction that consists of a reflector panel, an insulator panel, a solar panel, and a water reservoir. In combination they allow the bag to heat up water in a short amount of time. In addition to great insulation the solar shower has an easy to use ON/OFF shower head, a large screw cap valve for easy filling, a side pocket for shampoo/soap, a velcro straps for wash cloths, and a built-in water temperature gauge to know when the water is ready. Overall the Advanced Elements shower bag is a premium product that will last for years if not decades. Its portable design makes it perfect for backpacking/camping and allows you to take it anywhere you go. The bag is also extremely efficient and heats water in a short amount of time. So check out this device as it’s a quality product. Super durable and rugged design. Quick and efficient heating times. Second on the review is the Colman solar shower. This particular shower is one of the most popular. Reason for is because Colman is a reputable company in the outdoor industry. The solar shower is also very cheap even though it’s still a great product. Like the above product the Coleman has a water capacity of 5 gallons. This is enough for multiple showers and will sufficiently clean you completely. If needed you can extend the number of showers by simply using less water per rinse. In order to use the Coleman you must first fill it up through its resealable screw cap. Once completed screw on the cap back on and lay it flat on the ground in direct sunlight. Leave it in the sun for 2-4 hours (with the clear side exposed) and the water should reach a warm temperature. Unlike the above solar shower the Coleman does not included a temperature gauge. This can be annoying at times because you truly don’t know what the temperature of the water is. The only way to figure out if its right for you is to pour the water out a bit. Along with this some people have complained the bag leaks a little and that the handle might rip off due to the weight. With all that being said the Coleman solar shower is still a great option. It gets the job done and allows you to take a warm shower while in nature. It’s also considerably cheaper than the above option which is a big factor a lot of people. So check this device out and form your own opinion on it. Popular option among people who camp a lot. Third on the list is the Coghlans Solar shower. This particular product is very similar in build and quality as the Coleman shower. It’s also extremely cheap which makes it a popular option on the market. 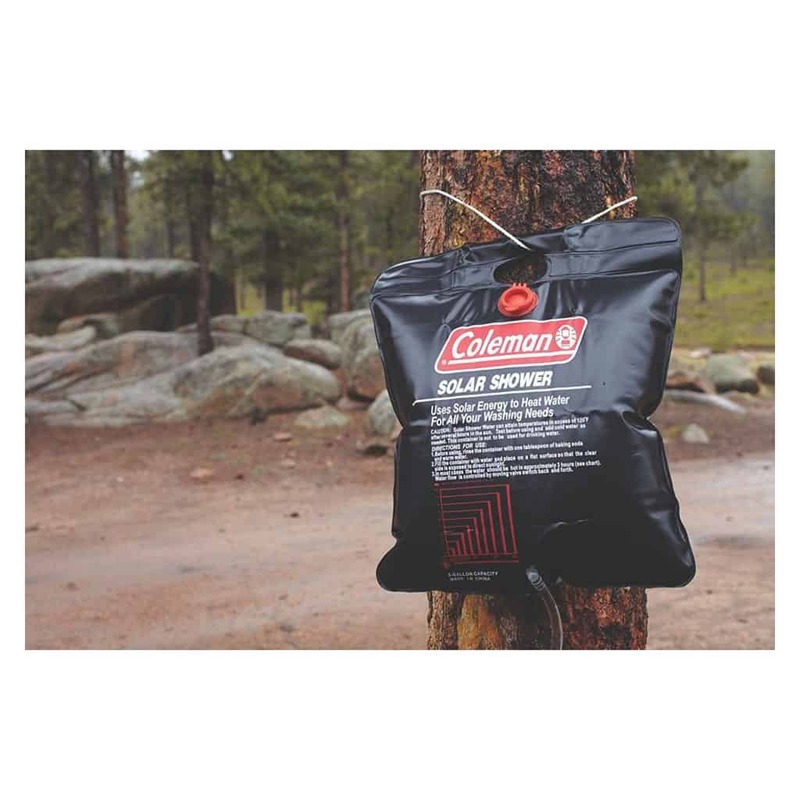 The Coghlans solar shower uses a large capacity bag that can hold a total of 5 gallons. This is large enough too shower up to 2-3 people (if done correctly). When using the shower bag you must first open its plastic cap. Fill up the bag completely with water and close the cap tightly. After this you set the bag in direct sunlight for 2-3 hours until it reaches your desired temperature. On negative thing is that the Coghlans doesn’t come with a temperature gauge. So when you actually check the water you basically have to guess what temperature it is. While this isn’t the biggest issue, it’s definitely more convenient to get an accurate reading when checking your shower water. On the positive side this shower bag is made out of non-toxic PVC materials. This is a big plus for many as you don’t want to shower in water that has been contaminated by the plastic. On the other hand the materials used by this solar shower aren’t very durable. For this reason some people complained that their shower ripped because the bag couldn’t handle the weight. In the end the Coghlans solar shower is a top contender due to its cheap price and portable design. Just remember that it isn’t very durable and a lot more likely to rip than other solar showers on the market. So keep that in mind when looking at this device. Fourth on the review is the Viking Nature Solar Shower. This is another premium solar shower that has everything you need to shower effectively outdoors. It’s also very durable and will last a lot longer then some other cheap options on the market. The Viking Nature has a large 5 gallon capacity. Once filled up completely you can use it 2-3 times without running out of water. To use the shower you must first open unscrew its durable cap and fill it with water. You then close the cap and place the shower on a flat surface. After around 2-3 hours the water should be warm enough to take a shower. One great thing about this bag is that heating times are slightly better than some of the cheap options above. This is simply due to its 4 ply construction. It uses a clear PVC sheet, a black PVC sheet, thermal insulation foam, and a green color ripstop fabric to get the most heat possible. The Viking Nature also includes some other cool features that are very useful. It has small mesh pocket for toiletries like shampoo, soap, toothpaste, and etc. It also has convenient velcro straps to secure the hose to the bag. The hose itself is kink free and super flexible. The shower has a built-in temperature gauge which is possibly its most important feature. Overall the Viking Nature Solar Shower is a great option to choose from. Like the Advanced Elements its super durable and can withstand the wear and tear of the outdoors. In addition the shower includes some extra features (like the temperature gauge & mesh pocket) that some other cheaper options don’t include. So if you want a long-lasting solar shower then this might be the product for you. Great insulation gives it quick heating times. Comes with a temperature gauge. Last on the list is the RISPERO solar shower. This is the largest shower on the list and has a huge capacity that is twice the size as most other products on the market. With that being said its extremely large size isn’t the best option for most people. For this reason it landed last on the review. As we mentioned above the RISPERO has a large water capacity and can actually hold a whopping 10 Gallons. This is a lot of water and is huge compared to other products on the market. Since its capacity is so big around 5-6 people can shower from just one filled bag. When using the RISPERO solar shower you first have to open up its water injection leak-proof cap. Fill up the shower with your desired amount of water and close the cap on tightly. After you do this you simply lay the bag in direct sunlight and wait for it to heat. When testing it we found that it took an average of 3-5 hours to heat up the water effectively. This would change depending on how much sun we got and how much water we put in the bag. So if you fill the bag all the way to 10 gallons then expect heating times to be pretty long. One great thing about the RISPERO solar shower is that its made from environmentally friendly materials. The PVC bag is safe for human health and is durable enough to last the outdoors. Another key feature this shower has is a built-in temperature gauge. Which takes the guessing game out of the situation. One thing to keep in mind before buying this product is that it doesn’t include a pocket to hold your stuff. This can be a pain since you want your soap near by when taking a shower. Another thing is that the hanging straps are pretty cheap and don’t seem like they can hold the full weight of 10 gallons. So keep that in mind when looking at this device. In the end the RISPERO is a great option if you need the largest capacity possible. It truly holds a lot of water and can shower 5-6 people. To add onto this the shower bag is pretty cheap and cost around the same amount as smaller bags. Just keep in mind that this cheap cost means a cheaper product. So it’s not as durable and rugged and other options on the market. Solar showers are super handy and are a perfect product for anyone who goes outdoors a lot. They can be used in a wide variety of situations, but are specifically perfect when camping, backpacking, at the park, or even at the beach. While they aren’t as functional as a full home shower, they still are great devices with a ton of benefits. Possibly one of the most important benefits of solar showers is their convenience. The convenience of having a shower literally anywhere you are. All you need is a source of water, a few hours in the sun, and something to hang the bag off of. No need for an outlet or batteries as you have the power of the sun. Another benefit of solar showers is their portability. When empty these solar showers only weighs a few ounces. This is essential as most people buying these showers are camping or backpacking. Their light design allows them to be easily stored away without any inconvenience. The last benefit of solar showers is that they are good for the environment. Unlike most products these days, solar showers only use free energy from the sun. You don’t need gas or propane to heat the water. Instead, you only need a few hours in direct sunlight and the patience to wait for warm water. Overall solar showers are awesome devices that can be used by anyone who is outdoors a lot. They are super convenient and are a great addition to any outdoor kit.